Two avid SportsGab and NFL fans Adam Ward and Jason Zone Fisher won Gillette’s Ultimate Summer job contest this summer and are travelling the country attending numerous sporting events, concerts and parties, turning skeptics to believers along the way for the new Gillette Fusion ProGlide! As always at the Gab Network, we love hearing from our great readers, so leave your pick for NFL fantasy sleeper of 2010 in the comments section below. 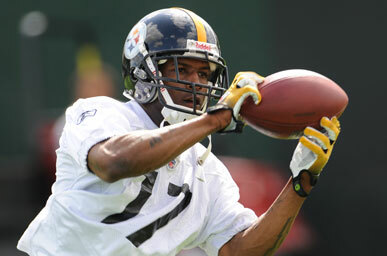 Mike Wallace, WR Pittsburgh Steelers – With the loss of Santonio Holmes to the New York Jets this offseason and the aging (yet uber-reliable) Hines Ward, sophomore Mike Wallace has the opportunity to be the Black & Gold’s deep threat and overall stud. Quarterback Ben Roethlisberger set personal records last season in passes attempted, passes completed and overall yards passing, so the time-tested Steeler philosophy of grinding out games on the ground and smash-mouth defense may be slowly altering on the offensive front. Wallace reminds us of the AFC-version of DeSean Jackson, with explosive speed and great hands to tout. Devin Aromashodu WR Chicago Bears – The bears are coming off a disappointing 2009 season and are looking to come out of the gate firing in 2010, with a newly revamped offense that has key additions such as Chester Taylor and new offensive coordinator Mike Martz. Aromashodu has a strong chance to break out and glide as an emerging star of the NFL this year. He’s a great route runner and is a few inches taller the Johnnie Knox and Devin Hester, in turn making him Megan Fox appealing in the end zone. Not to mention, however, the fact that Martz is now calling the shots in Chi-town and we all know how much he loves having a QB with a cannon for an arm. His success may hinge on Jay Cutler’s TD/Interception ratio, but he should find multiple red zone targets due to his height and physicality. LeSean McCoy RB Philadelphia Eagles – Not really a shocker here, but when Brian Westbrook went down with a serious concussion last year no one picked up the slack more than LeSean. He rushed the ball 155 times for 637 yards and 4 touchdowns while also racking up 40 receptions for 308 yards. Those numbers sound shockingly similar to a healthy Westbrook (not a bad player to mold your career around). The other factor that landed McCoy on this shortlist is that the Eagles, for the first time in at least a decade, will be led by a QB not named Donovan McNabb. This may change head coach Andy Reid’s game plan to a run first pass second philosophy. Chad Henne QB Miami Dolphins – Last year Chad Henne had a great breakout campaign when veteran Chad Pennington went down. In 14 games he racked up nearly 2,900 passing yards with a respectable 60% completion percentage. Those numbers don’t normally stand out to the naked eye but when you add quite possibly the league’s best receiver in Brandon Marshall (to a receiving core that already touts Greg Camarillo and Davone Bess) the Dolphins could have something brewing in South Beach. It’s also worth noting that Henne will be throwing in a system that has recently driven defensive coordinators crazy due to the trickery involved in their running game/overall offensive scheme. Early Doucet, WR, Arizona Cardinals – With the departure of star wideout Anquan Boldin to the Baltimore Ravens, Doucet has an opportunity to star as a slot receiver in the Cards offense. Losing Kurt Warner won’t help his numbers, but Doucet has a similar frame of Boldin and can most likely make some noise against opposing defenses that need to focus on (and double team) perennial Pro Bowler Larry Fitzgerald. While Doucet’s teammate Steve Breaston is projected to start across from Larry Fitzgerald, he’s ultimately an unproven wideout showcasing online flashes of brilliance and consistency. Doucet’s time to shine is now to prove he’s a reliable target, especially in the red zone. Really nice collection of sleeper possibilities here. I really like Wallace to have a big season and for Henne to surprise with the addition of Marshall. Aromashodu could show something too, but that offense is a little scary to rely on too heavily.